I’m certainly no expert on etiquette in the operating room but I’ve learned a few helpful things for us non-medical folks over the years. 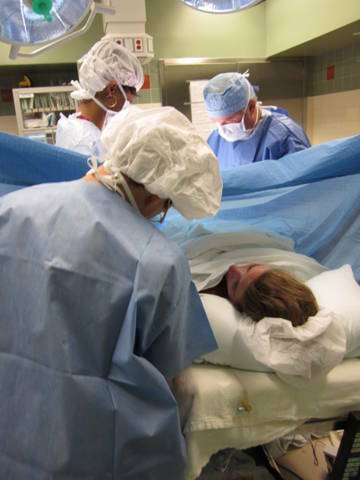 100% of the time, when my client makes the cesarean decision, she is told that only her partner can go into surgery with her. I’ve learned to question that policy. Usually I’m still left alone in the L&D room staring forlornly at the remains of their labor scene. But perhaps six times now (and three of those happened this year) I accompanied the couple past those double doors. To the operating room. 1) How can a doula get an invitation? Ask. Ask quietly but with confidence. Let them know it isn’t your first rodeo. Ask everyone. Ask the nurse. Ask the OB. Ask a passing nurse in the hallway. The first answer will probably be “no.” The nurse and OB usually defer to the anesthesiologist. Why this god of the operating room gets to make the call, I have no idea. But s/he does. I’ve found that the nurse and OB often “forget” about my request. So I ask again. 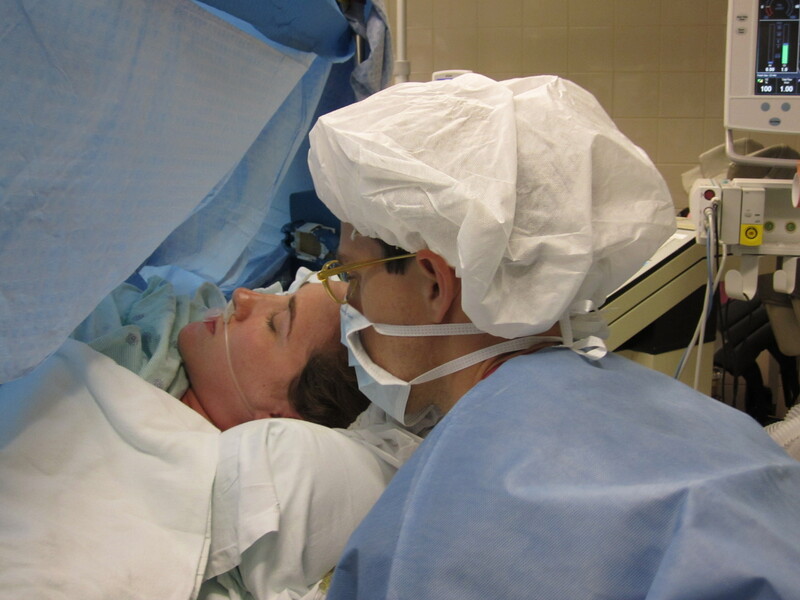 “Would you ask the anesthesiologist to make an exception and let me go with my client? I’ve been allowed to back before. ” Repeat. Repeat again. 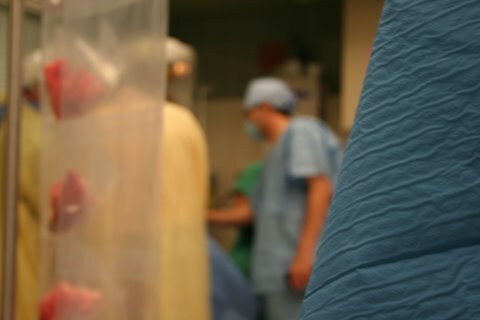 Before the cesarean, the client may want to make her special requests to the OB (delayed cord clamping, dad to announce gender, keep the placenta, etc). Of course, you might also remind staff of these choices in the moment. Just in case they forget. 2) What will you wear to the party? Usually I’m given the same paper scrubs as the dad. They may be huge. I’ve had to tie knots in the back of the shirt 1980’s style. Once a kind nurse brought me cloth scrubs in my size. It was wonderful! 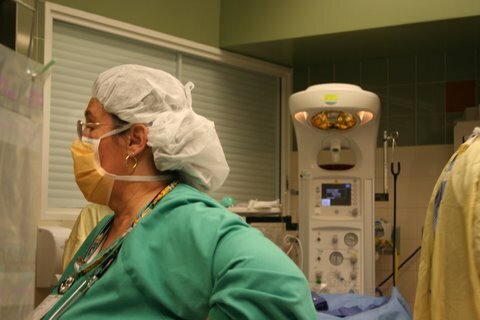 Mainly because I was wearing the same color and fashion of all the other masked nurses and had more freedom to move about the OR. Doula undercover. You’ll also get a fancy shower cap, mask, and covers for your shoes. Strangely, no gloves. 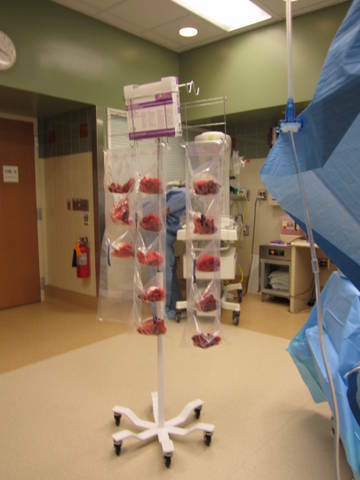 But there is usually a hand sanitizer pump just inside the operating room. I use it just to be on the safe and clean side. You will be ushered to a stool beside the mom’s head. Maybe once or twice, I was directed to stand. This is the time for grace. No tripping over your feet or craning your neck for a view. Prove to the anesthesiologist and/or nurse anesthetist that you’re one of the cool kids. Sit. Meekly. Hands folded. No snapping pictures yet. Perhaps a nod to the medical staff. Mom will be lying flat on her back with her arms outstretched. Often her arms will be strapped down. There will be a curtain between mom’s chest and her belly. When I’m standing, I have to stand on my tiptoes to see anything on the other side. I do not recommend standing on tiptoes. See earlier mention of grace. Sitting/standing behind mom is the nurse anesthetist and/or anesthesiologist. This person is monitoring mom’s vitals. You want this person to like you. This is the aforementioned god of the OR. The OB is below the curtain with his/her surgical assistant(s). Sometimes a student and an attending are chatting in the background as in the picture below. Classy. Mom’s labor and delivery nurse is there. Often with an L&D nurse who is on cesarean duty. Near a baby warmer is a pediatrician and a baby nurse. See them in the background? Try to look beyond the bloody gauze in a hanging shoe organizer bag. No, it isn’t really a shoe organizer bag. But it surely looks like one hanging there. Once the surgery is underway, I sort of inch my way out of the stool and move away from mom’s head. I want to get some pictures of something other than a blue curtain. This part is when I’m in ask-forgiveness-rather-than-permission mode. This part is also how I’ve managed to watch and photograph from below the curtain. Just call me Sneaky McSneakerson. During this time, partner stays right by the mom. There isn’t any physical support that can be offered during this time. Mom can’t have ice chips or a cool cloth. Her partner’s presence is THE essential support. Of course the big moment is when the baby is lifted up over the curtain for mom to see. Often the partner is instructed to stand up to see this moment. The curtain is usually lowered a bit. The OB passes the baby to a nurse. Baby goes to the warmer for the pediatrician to check. This is standard for cesarean. I switch places with the Dad so he can follow baby while I stay near to mom. I pass the camera to Dad. And I giggle/cry/oooh/aaaah with the mom about the amazing baby. I describe what I see happening over at the warmer. “Aww, baby just got her first rectal temp. check.” Good stuff. If it is taking a long time, I will grab the camera back and show mom pictures of her baby. Post-birth, I’ve also noticed that many moms experience pressure in their abdomen. Sometimes they are shaky or feel dizzy/nauseous. Blood pressure might drop. There isn’t much I can do except encourage and normalize her physical feelings. Or speak to the nurse anesthetist about what she is feeling. Dear super doula, you can be a game-changer if you play the cards right and all the stars are aligned. You can sometimes get almost-immediate skin-to-skin contact for your client. If the pediatrician and the nurse anesthetist/anesthesiologist agree, your humble request may be granted. You may have to pinky swear you’ll hold the baby in place especially if they are unwilling to unstrap mom’s arms. And swear on your great-grandmother’s tomb that you will not let the baby get cold. When your wish is granted, unsnap mom’s gown at the shoulders, expose some skin. There may be monitors stuck to her chest. Ignore them. Place baby skin-to-skin on mom’s chest, cover baby with a blanket, and then you or partner hold the baby there. 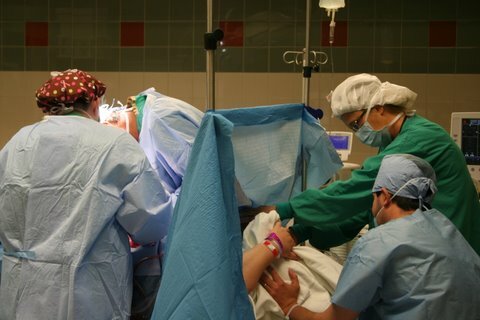 Sometimes, against the hopes and dreams of the medical team, the precocious baby will even latch on to a breast while the OB sutures away below the curtain. Babies don’t know hospital policy. It is tough to see since I pinky swore baby would stay covered by the blanket, but the picture below is a baby skin-to-skin. However, please be attuned to mama during this time. 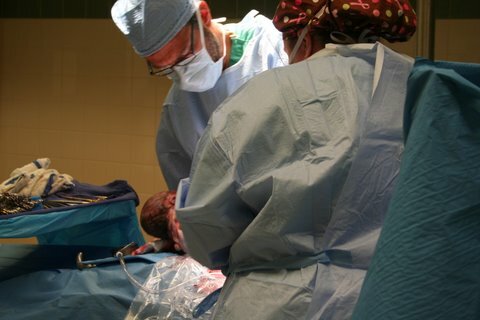 She may have been vocal about skin-to-skin before the surgery. But a cesarean is a pretty big deal. And if she doesn’t feel able to hold her baby just then, encourage dad to hold on to baby (and not to let go!). Cesarean births can be a tad bloody. Expect to see bloody guaze, perhaps some blood on the floor. Sounds of suction. 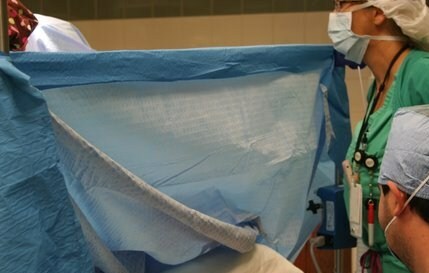 The smells can be strong especially if the OB uses a cautery. 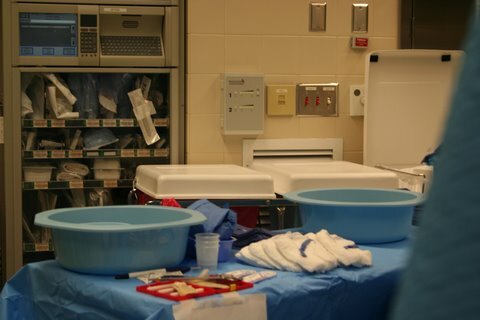 And it is a little unnerving when the OB and nurse count the instruments and gauze to double-check that nothing was left inside. I have plenty of pictures to illustrate my point but I think I’ll spare you. Sometimes birth partner and doula are asked to return to the L&D room or recovery with the baby. 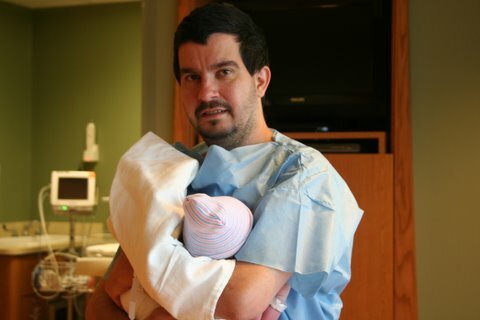 If the nurse says to put the baby in the warmer in the room, I suggest dad strip his shirt off and do his own skin-to-skin with his offspring. Makes a nice picture for mom to see later. Dad should be clear about mom’s wishes for possible baby procedures. If he isn’t sure and it is not an emergency, he would be wise to delay until mom is there. At some point soon after, everyone is reunited. If I’m told the policy is only one person in recovery, I pretend I didn’t hear. Yep, I develop strange and sudden hearing loss. I melt into the background (those nurse scrubs sure could help!) or become indispensable to someone. I have not yet been kicked out of a room after the one-person-policy has been stated. The same technique works for epidural placements. Just pretend the rule doesn’t apply to you. “Hmmm? Who are they talking about? Not me, surely.” Or write intently in your client folder and don’t make eye contact. Be invisible. Your job is now breastfeeding initiation. 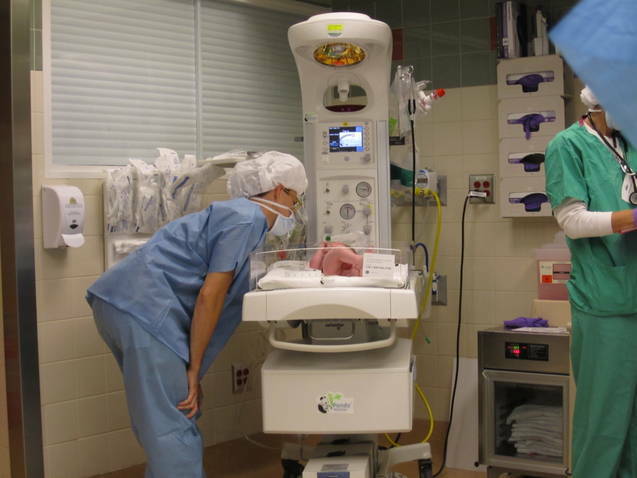 The L&D nurse or recovery room nurse will focus on mom’s blood pressure and other vitals. Sometimes mom needs to lie almost flat until her bp stabilizes. But babies can still nurse. You may need to hold a breast and hold a baby because mom might be weak or shaky. One client tells me she remembers very little of this time but she is thankful that someone was there to (literally) support her and baby. I hope that helps some! 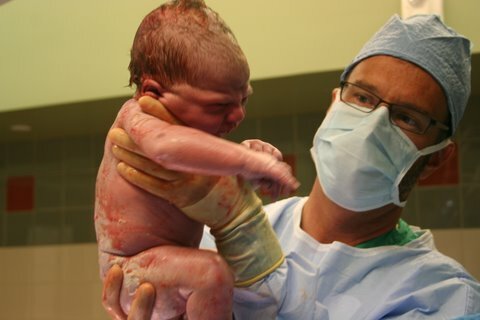 Does anyone else have insights into the world of cesarean birth? Was your doula able to accompany you? 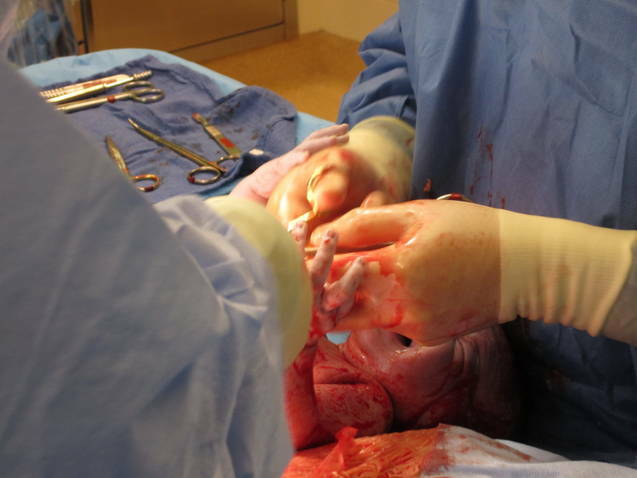 What could have made your cesarean birth better? What can you add? *And a big special thanks to the families who let me share these pictures!